For most of the Middle Ages, the small island of Gotland in the Baltic Sea essentially ran its own affairs, while being under the nominal authority of the King of Sweden. The laws of the island were known as the Guta Lag, and eight manuscripts – the oldest dating back to the 13th century – have survived, but some of these laws may date as far back as early as the 12th century. Guta Lag details laws over a wide range of situations, from crime, to inheritance, to trading goods. You can find laws about buying a horse, if you pull a man by his beard, and when you could hunt squirrels or rabbits. One law demanded that anyone who had a farm had to set aside some land for turnips each year, or face a fine. When it came to marriage, the laws imply that these were arranged by one’s parents. Guta Lag notes that “if a man seduces another man’s daughter or one of his wards into betrothal without the authority of her father or kinsmen, then he must pay forty marks to the complainant” – one historian has calculated that twenty-four marks would be the value of wealthy farmstead on Gotland, so this fine was substantial. Concerning the wagon-riders’ procession, no more than two shall travel in each wagon; but the ride of the relatives is abolished. The nuptial mass is to be sung where the bridegroom is and the wedding breakfast is to be held. The bridegroom shall three men to his bride and the chief bridal attendant shall wait where the nuptial mass is to be sung and the wedding breakfast held. And the wedding feast shall be held with drinking for two days with all the people (ie. guests) and gifts are to be given by everyone who wants to according to their inclination. But contributions by the guests to the wedding feast have been abolished. On the third day they (ie the bridal couple) have the right to invite the wedding hosts and the masters of the feast and their closest kinsman to stay. As many toasts as the householder wants shall be drunk prior to the toast to the Virgin Mary. But after the toast to the Virgin Mary, then everyone has permission to leave and further ale is brought in. Everyone who breaks this rule must pay twelve marks to the authorities. And whoever comes uninvited to a wedding or feast is the pay three öre (an öre was worth 1/8th of a mark). 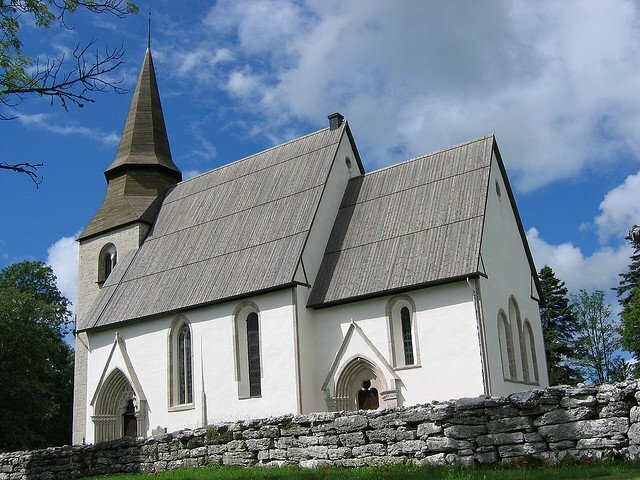 Weddings in medieval Gotland took place just outside a church, and would be followed by a nuptial mass inside the church. Before it began, the groom would send men to go fetch the bride from her home, whereupon she and entourage would arrive by wagon. The chief bridal attendant was usually the priest’s wife, and it was her job to dress and prepare the bride. Christine Peel has translated these laws in Guta Lag and Guta Saga: The Law and History of Gotlanders, published in 2015 by Routledge.